In order to meet ever more stringent market requirements that call for reliable, high quality products and systems without exorbitantly high price tags, Tecnosoft has extended its current range of dataloggers by developing the SterilDisk data logger. The SterilDisk data logger innovative device extends the range of Tecnosoft dataloggers, such as the TempStick temperature data logger and HumiStick for temperature and humidity. The SterilDisk data logger device has been developed hand in hand with end users; it is easy to operate and comes with software program that is simple and intuitive nonetheless powerful and versatile. Furthermore, Sterildisk's technical characteristics place this device among the reliable, performing devices in its category. The device is housed in a stainlesssteel (AIS316) disc, 36mm in diameter and 18mm high, including a food compatible elastomer. SterilDisk comes in two forms: the standard version as a circular disc; and the external probe version with a rigid stainless steel probe of configurable length with an M5 threaded part. The SterilDisk data logger device covers a temperature range from -40°C to +140°C; has protection grade IP68 and can withstand a pressure of over 10bar. The possible applications are many: from temperature monitoring during food and liquid processing to the verification of temperature uniformity within autoclaves and sterilisation chambers. The software is simple and straightforward and is used to launch monitoring missions, download the data from the device and view this data in graph or table format, save the missions in the program database as well as print reports for mission traceability. Each device is identified by means of a fixed, unique serial number; it contains are placeable battery that lasts for over two years under normal operating conditions. When a mission is started, the acquisition rate may be set that may vary from one reading every 5 seconds up to a maximum of one reading every 4hours 15minutes. SterilDisk can log over 15,000 acquisitions. 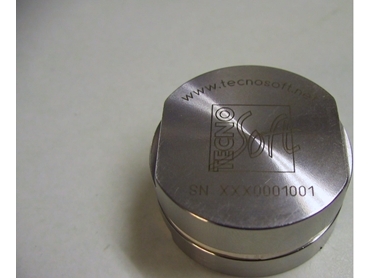 Like all other Tecnosoft dataloggers, SterilDisk may be supplied with a SIT traceable calibration certificate. The price tag of a basic SterilDisk system that is a datalogger with or without calibration certificate, reader interface and the software package is competitive.